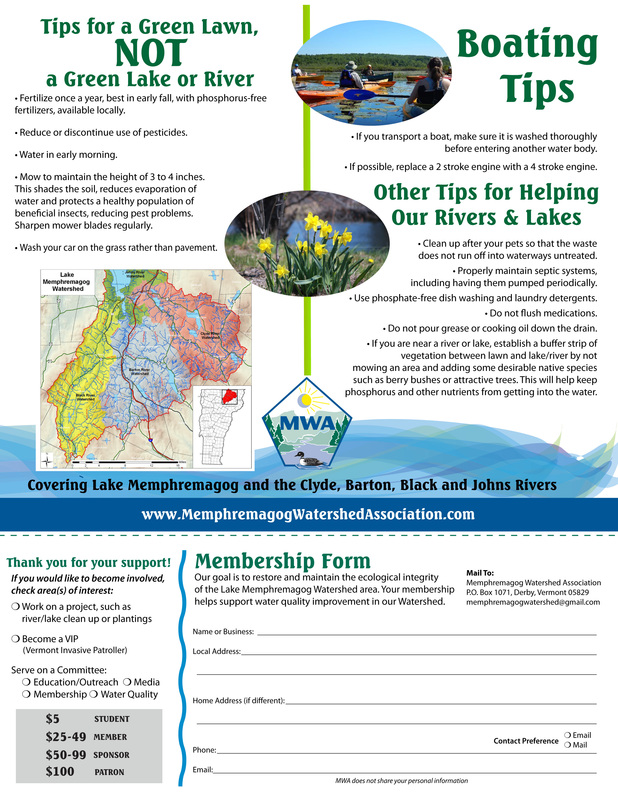 Fill out the form below and click on the donate button to complete your membership, or print our form and mail your check to the Memphremagog Watershed Assocation, PO Box 1071, Derby VT 05829. Membership levels are $5 Student, $25-$49 Member, $50-$99 Sponsor, and $100+ Patron. Thank you! After submitting your membership form, please click the "Donate" link below to make your membership donation using a PayPal account. 2. To protect and preserve our watershed. 4.For recreation and fishing we need vibrant, clean waters. 5. Assist in restoring/protecting the river waters that feed the lakes. 6. Become involved with streambank, riverbank restoration. 7. An excellent opportunity to meet other concerned watershed residents. 8. MWA works in partnership with other associations to promote awareness.